A finger licking recipe with the balance of taste and flavours is without any doubt the Mambazha Pulissery. The sweet ripe mangoes cooked in coconut and yogurt based gravy. The sweetnesss from mangoes and the sourness from the curd. With hot steamed rice tastes irresistible. Easy to make tasty Onam Sadya dish. Generally prepared when the mangoes are in season. It is one of my favourite Ona sadya preparation. The juicy mangoes lightly absorb the masala and tastes very nice. Try this yummy preparation for this Onam if you have not tried yet. Peel the mangoes and no need to cut them. You can use as such for the curry. If the size of the mangoes are too big then cut them in to 2 or 3 big pieces. Grind coconut, cumin seeds, garlic, turmeric powder and chilli powder as a fine paste using a blender. In a pan add the mangoes and pour a cup of water and salt. Cover it with a lid and cook till soft around 5 minutes. Add the ground coconut paste inside the mangoes and mix well. Add little water if the curry is too thick. Allow the curry to start boil. When the curry starts to bubble add the beaten curd (you can add inside the blender and give a pulse) and stir well to mix evenly. Immediately switch off the gas once the curry get heated. Donot allow the curry to boil after adding the curd. Then the curry tend to split. Heat oil in a pan and splutter the mustard seeds and add fenugreek seeds. Add the broken dried red chilli and curry leaves and fry in that oil and pour the tempering on top of pulissery and mix well. wow Lincy..this was my favourite way from schildhood days..still is. BY bestie with rice!!! love the way you have presented it. Good job dear. Feel free to drop by mine too when you get the time. This is my favourite of all puliserries. Looks absolutely delicious and inviting. Looks very tempting.. 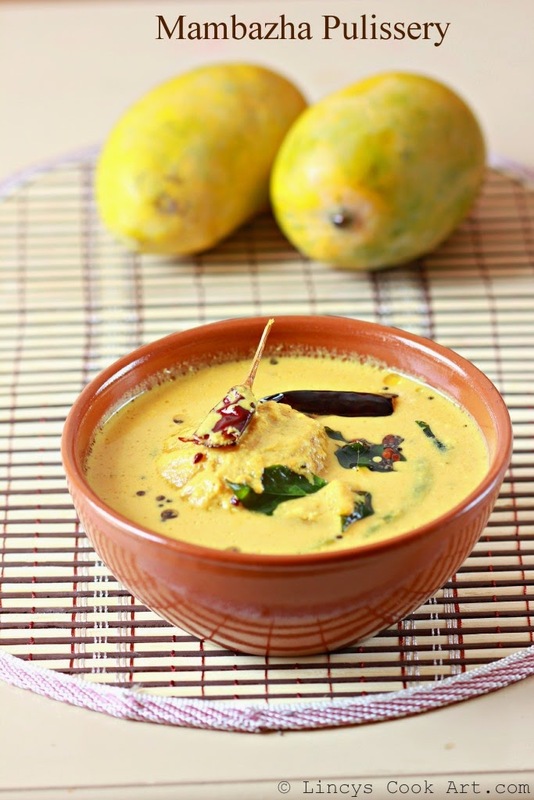 I'm drooling here..
Mango in coconut gravy, sounds interesting........ Looks yummmy!!! looks so delicious, never had it so have to try it soon. Mambazha pullisseri looks delicious....wish to eat now...very tempting pictures ..
Mambazha pullisseri looks delicious and yummy....tempting clicks Lincy..
Who will say no to this irresistible dish, definitely not me..delicious pulissery.